Feel free to skip the report and go directly to the photogallery. This year’s San Diego Comic-Con (SDCC), held July 19–22, 2018, had already promised to be personally special since, a few months prior to the show, much to my great surprise and honor, I was invited by Comic-Con International (CCI) to attend as a Special Guest. 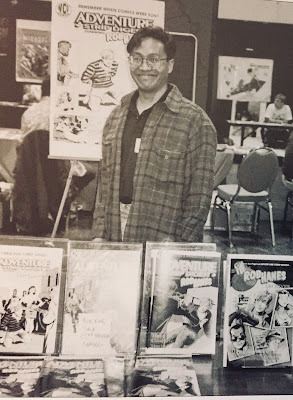 This journey—from a fan attendee in 1986, to a zine/small press/indy publisher in the early 1990s, to the honor of being a special guest and Inkpot Award recipient in 2018—goes way beyond what I could ever have imagined what my younger self, as an aspiring cartoonist, could have ever imagined possible. For these reasons, this year’s Comic-Con was particularly significant, and one, of course, I’ll always remember. As I announced before the show, this year marked my 21st appearance at SDCC since 1993 and my 15th consecutive since 2004. 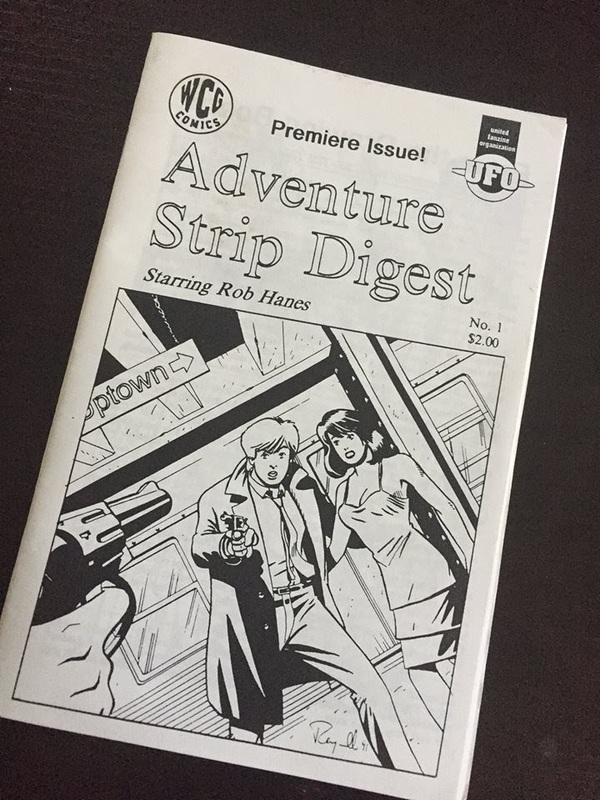 I debuted issue 19 of my indy comic-book series, Rob Hanes Adventures, at the show as well as a new trade paperback, Rob Hanes Adventures, Vol. 2, that collects issues 5-8 of the series. I also introduced a new bookmark giveaway and ordered a new bunch of pin buttons for the show which are always popular. While I’ve had Facebook and Twitter accounts for several years, being the dinosaur I am, it wasn’t really until this year that I started learning to be more proactive and have fun on my social media accounts, by interacting with others and posting live during my appearance at SDCC. As a Special Guest at this year’s SDCC, a spotlight panel was scheduled for me on Thursday, July 19, at 12:30 p.m. in Room 4. I must admit I was a bit nervous by the prospect, primarily because I wondered who would show up! SDCC gives its guests some flexibility on what to plan for the hour--to somewhat broaden interest in the panel, I prefaced the panel title, “Adventures in Self-Publishing: Spotlight on Randy Reynaldo.” I also asked a longtime comics industry friend and colleague—Barry Gregory, CEO of Ka-Blam Digital Printing—who was also exhibiting at the show (under Gallant Press) and knew my work well, to serve as moderator to help share the load with me. Barry turned out to be a great panel partner! Though there wasn’t much time to promote the panel during the show itself since it was on the first day of Comic-Con, I nevertheless printed up some promotional postcards and shared some with Barry to distribute at his booth (Gallant Press) and with his wife, Jenni Gregory (Dream Walker Press), who had her own booth at SDCC. In retrospect, I’m glad the panel was Thursday so that I got it out of the way quickly, giving me an opportunity to savor the experience for the remainder of the show! Prior to the show, Barry and I exchanged some messages a few times to talk about plans for the panel and found we were on the same page. (Barry has served on panels before but this was his first time at SDCC.) I also put together a few slides to provide visual interest and samples of my work. I have to admit I had some nerves that morning and, partly to calm myself, attended a panel focusing on fellow Special Guest Maggie Thompson and the Comics Buyer’s Guide (CBG) that was scheduled at 10:30 a.m. in the same room as my own panel. Since I am at Comic-Con to “work,“ I rarely attend panels during SDCC, but this was a spotlight I was interested in attending and had tweeted about prior to the show. The panel was terrific, a great look back at the CBG, which back in the day before the internet, was the best gathering place for comics fans outside of attending a comics convention like SDCC. Joining Maggie on the panel were comics/tv/animation writer and producer Mark Evanier, cartoonist and comics historian R.C. Harvey (an Inkpot recipient himself this year), and former Wizard Magazine and CBG writer Scott Brick, now a preeminent audiobook narrator and, full disclosure, a longtime personal friend dating back to our college years at UCLA. By the way, Scott is also a bonafide comics fan, his knowledge in many areas far surpassing my own! During Maggie’s panel, I was surprised by the number of shoutouts, from Maggie (who recognized and waved to me when I entered the room); R.C. (who did too, as well as plugged me and my book during the panel); and Scott, who has always been generous in crediting me for getting his first writing gigs at Wizard and the CBG, as well as into audiobook narration—I am always quick to note, however, that once he got his foot in the door, Scott’s talent carried him the rest of the way. (Scott is also regularly called upon by SDCC to moderate panels.) When it ended, Maggie called out to me, asking if I was up next, but I responded from the audience that it was in another hour. In any case, being in the room and watching the easy conversation of the panel did the trick in calming my nerves. An hour later, I made my way up to the room for my panel, joined by my family and several friends. When I walked into the room, I have to admit I was a bit surprised by the turnout! Good afternoon. 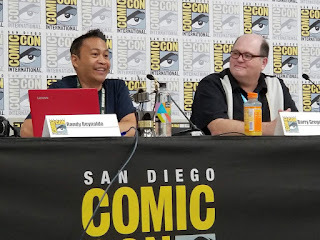 I’m Adam Neese, Assistant to the Director of Programming for Comic-Con International, and I’m pleased to be here today to celebrate the career of special guest Randy Reynaldo. 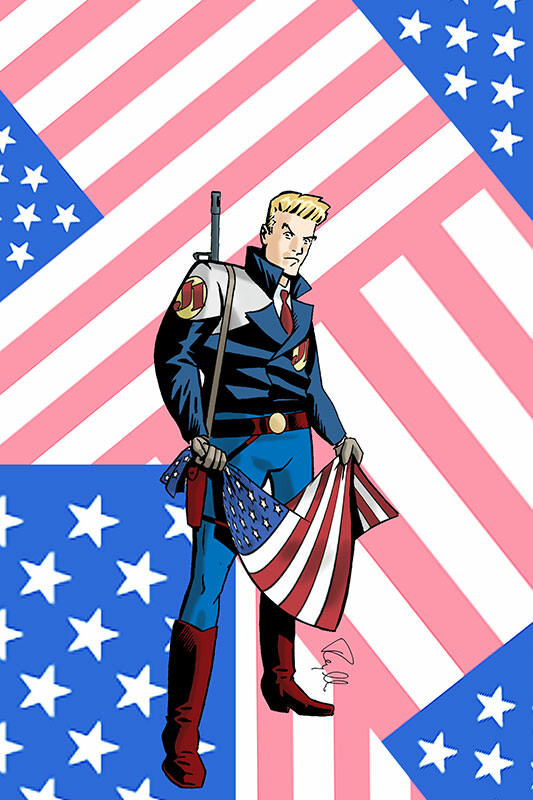 His self-published comic series, Rob Hanes Adventures, has been thrilling readers for two decades, and the upcoming issue #19 is taking its inspiration from our current political environment but maintains the fun and entertaining feel of the series. On behalf of Comic-Con International and its Board of Directors, it’s my honor to present our Inkpot Award for Achievement in Comic Arts to Randy Reynaldo. I have been half-joking that the recognition is for sheer stubbornness—of course I cannot speak for the selection committee, but I like to believe the award is partly a recognition of my commitment to consistently producing an independent comic-book series year-in and year-out and exhibiting at SDCC for so many years that is rooted in the classic adventure comics tradition. Rob Hanes Adventures has always been a labor of love, and I’ve been happy to toil away on it within my tiny little corner of the field, but having the work honored and recognized in this way by CCI and my peers of course goes way beyond whatever recognition I could have ever dreamed! And as I mentioned earlier, Barry turned out to be an outstanding moderator and panel partner—though I had no trouble talking about myself or the series once I got started, he always had a question ready to throw out when I had exhausted myself with anecdotes. I was impressed by the depth of his questions, confirming he really is a fan of the series! I can think of no better compliment than the fact that Scott Brick, an old hand at moderating these panels, also said Barry did a terrific job. I was glad when Barry told me he had a lot of fun too. As one can imagine, I returned to my table on a high and Barry and I had a nice lunch afterwards (on me!). It was a wonderful experience I’ll always remember and it was a thrill to be able to display my Inkpot at my table during the show, which many random people recognized and congratulated me on. While the ceremony ran long, as such awards show invariably do, the evening was nevertheless enjoyable and memorable--keeping up the star-studded nature of the ceremony, presenters included entertainment industry folks like Nichelle Nichols, Phil Lemarr (who served as the de facto MC), Leonard Maltin, Benedict Wong, and Helen Slater alongside comics industry luminaries like Sergio Aragones, Bill Morrison, Scott McCloud, Dave Gibbons, and Mark Evanier. The ceremony was genuinely moving at times—the event turned out to be a great celebration of diversity in comics, with a record number of women honored and recognized during the evening. Ats I mentioned to my tablemates, there were a lot of comics among the nominations I needed to check out! Many observed that this year’s show seemed a bit mellower than usual—for various reasons, sometimes having to do with production timing, a lot of Hollywood’s big guns did not have panels, with big fan draws like Marvel Studios, Game of Thrones and Westworld absent. And though fan-favorite franchises like DC, Doctor Who and Walking Dead were all in the house, many remarked at how much more accessible many of the panels were, including the infamous Hall H. (I saw several tweets throughout SDCC posting pics of non-existent lines outside the hall to get in.) Every day—including the Wednesday Preview Night—seemed equally crowded; on the other hand, the observation has been made that the new RFID badge system introduced a few years back has greatly reduced the number of pirated badges and played a role in the reduced crowds. While some have sometimes complained about how the entertainment industry has predominated Comic-Con, as I and others have noted over the years, SDCC is a big umbrella for all things pop culture and it’s easy to make it what you want—as such, there is always plenty of comics programming if that’s your interest and usually those panels have no wait to get into. 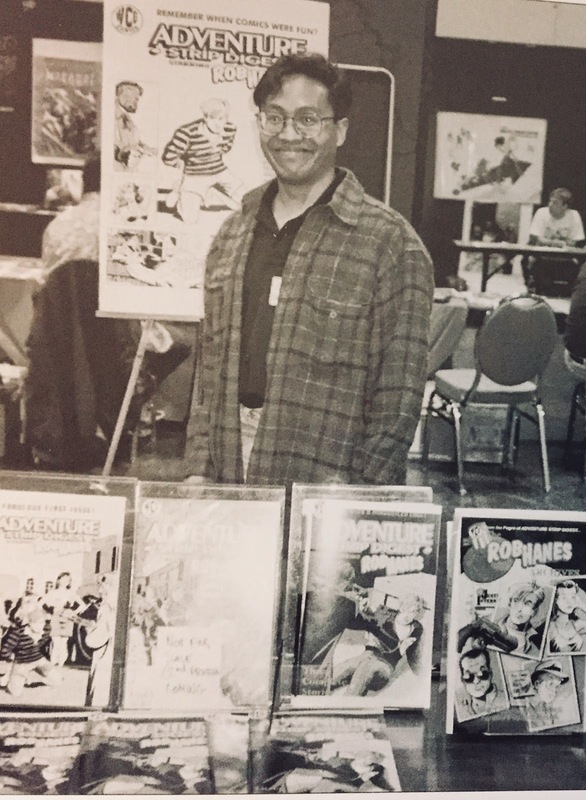 There were panels—often multiple—from all the major comics companies and most of the independents, as well as panels on individual cartoonists and legends living and past. The fact that there was a panel devoted to little old me—and the panel focusing on Maggie Thompson—is proof that plenty of comics programming can be found at SDCC and remains a core part of the show. A continuing trend has been the declining number of cosplayers at Comic-Con, which I’ve noticed for several years now. While it’s possible many simply aren’t going by my part of the exhibition floor, others had the same observation. Some say that the difficulty of getting into Comic-Con and cosplayers moving to other venues have contributed to the decline. While there were still plenty to be seen, they have not been as dominant as in years past. As always, my favorite cosplayers are those that are clever or unexpected—this year, I saw a cosplayer from the film A League of their Own (pictured at left) and I’m glad that cosplay from The Life Aquatic with Steve Zissou continues to be a thing (see my photogallery). Of course, it’s always fun to catch up with people—this year, this included cartoonist/inker Andrew Pepoy, Batton Lash and Jackie Estrada, cartoonist and comics historian R.C. Harvey, Sergio Aragones, Scott McCloud, Nat Gertler (celebrating the 20th anniversary of his publishing imprint, About Comics); cartoonist and storyboard artist Tim Burgard; and many others. As I've mentioned in the past, SDCC has expanded its footprint beyond the convention center. Programming both official and not occur in the hotels surrounding the convention center and in "pop-up" fan experiences around the venue. In fact, it's quite possible to still soak in the atmosphere of SDCC without even having a badge. Outside the convention center there were pop ups for the television shows The Good Place and Jack Ryan, and many others. The Disney theme parks are well known for having crowd management down to a science and I genuinely believe Comic-Con comes a close second. I’ve often told the story how I once was on a huge line for a shuttle back to my hotel and was convinced it would take about an hour or so to get on to a bus. Instead, I noticed that as soon as alert convention staff noticed this, they re-routed several buses to accommodate the line so my wait dwindled down to only as long as it took to load up the buses. I saw this happen repeatedly. Given the number of attendees and complex logistics, Comic-Con does a great job making things run smooth. CCI holds a "talk back" panel at the end of every show so that they can hear directly from attendees about what worked and what didn't and often make adjustments in response to this feedback. This year, for the first time, SDCC during the main convention hours completely shut down the main road in front of the convention center, Harbor Boulevard (which is a major thoroughfare) to vehicles and made them primarily pedestrian walkways with access only for the shuttle pick ups and drop offs. Having cartoonist Scott McCloud stop by my table to say hi and, after the conclusion of the convention on Sunday, bumping into him in a restaurant in the Gaslamp where both our families were having an end-of-Comic-Con dinner. A nice, leisurely lunch with my panel moderator, Barry Gregory, to celebrate our successful panel discussion. Stumbling across a booth (picture above) of a Russian comics publisher. Being interviewed by an entertainment show from the Philippines, which asked if they could interview me after asking if I was, in fact, Filipino. Celebrating the Inkpot Award with an enjoyable poolside dinner full of laughs at the Marriott Marquis Hotel Thursday evening with my old Comic-Con buddies, including my wife, my brother, good friend Bob, the above-mentioned Scott Brick, and college buddy Terry, who himself is a comics industry professional. And, of course, making new friends and being visited by longtime supporters of the series (many of whom you'll see in the photogallery. 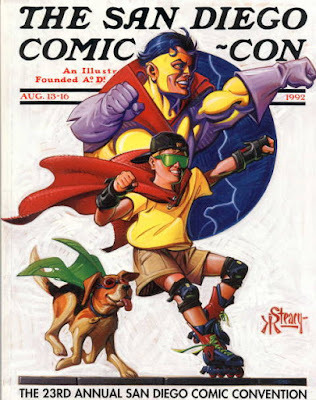 In any case, as one can imagine, this was of course a Comic-Con to remember. My family and I were well taken care of as guests and it's amazing to look back at this journey, starting as a fan attendee in the mid-1980s, to selling my zines and small press comics in the Small Press Area at SDCC in the '90s and '00s, to the honor of being invited as a special guest and presented with an Inkpot Award in 2018. It's certainly beyond what that attending fan in 1986 could ever have dreamed or imagined. My profound thanks to CCI for the recognition and memories they gave me. Below are select photos taken at the 2018 San Diego Comic-Con. Click here to see the full photogallery. To see a broader range of cosplay photos from Comic-Con, here is a link to IMDB's SDCC photogallery.